A year following the release of Neverwinter Nights, the game is still going strong. There are numerous player-made modules, custom files, and even persistent worlds now available, due to the ease in which people learned the Toolset wizards incorporated with the game. The full year has come around, and BioWare and Floodgate Entertainment have released the first official expansion for Neverwinter Nights, entitled Shadows of Undrentide. Will it be enough to garner a new wave of gamers? 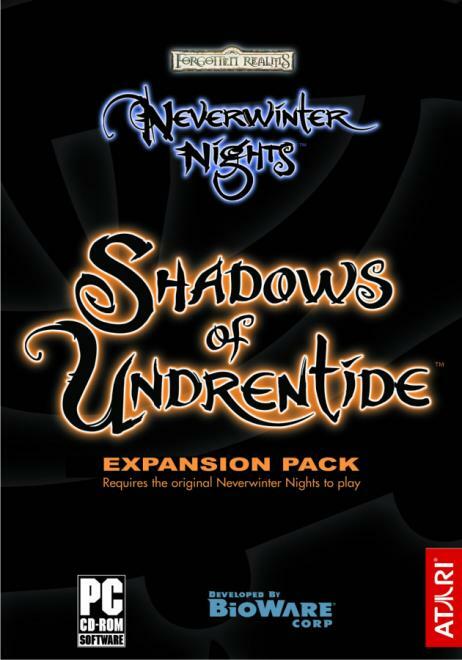 Before starting, it is important to note that Shadows of Undrentide is a parallel story to Neverwinter Nights, meaning that you can not import your level 20 character and start from the beginning. This can cause for a bit of frustration, as those players who were able to endure the entire original campaign worked hard on developing their characters. With that said, Shadows of Undrentide initially gives you the familiar character creation screen. Along with it, though, you have the opportunity to begin a new character with some of the many new feats and skills added with the expansion. Some of these skills and feats are well placed, and deserving to be placed into the game. For example, Appraise, which helps establish a positive or negative image for your character when bartering with merchants, is a welcome addition. Others, such as Tumble, seem to have been incorporated just to satiate specific gamers. Depending on how you view the game, and what you as a player search for in a game, the inclusion of these feats and skills can either be a boon or a bane. The game begins easily enough, and you learn you are one of four students for a Dwarven mage named Drogan. You're given a brief idea of what sort of people your future henchmen (in this case, it would be fellow students) are like. The conversation, though, is cut short as the sounds of battle are heard below. Being faithful students, you all flock to help protect Drogan. This is where the premise of the story is laid out, as you find Drogan fighting against a large number of Kobolds. Drogan inevitably falls to the numbers, but not before they are fought off by you, your fellow students, and a Harper named Ayala. Ayala explains that artifacts placed in Drogan's keeping had been stolen during the attack, and being Drogan's eldest student, you are to recover them. Early in, the story establishes a plot similar to the original campaign, in the sense that you're recovering items for the greater good (much like the collection of items for the Neverwinter plague). BioWare's track record in the sound department goes unhindered with this expansion. Once again, the voice acting, music, and sound effects are splendidly incorporated into Shadows of Undrentide. The character voices seem real and believable, and convey subtle emotions effectively. Although many of the basic sound effects and music have been reused from the original game, they are tried and true tools.